A fractured foot involved the bones which make up the bulk of the foot. These bones are protected by soft tissue and ligaments so fractures to these areas are very rare. But knowing the types, symptoms, and treatment of a fractured foot is still important, so you're always ready just in case you or somebody you know experience such accident. Scroll down to know more about the types of foot fractures and the broken foot treatment! 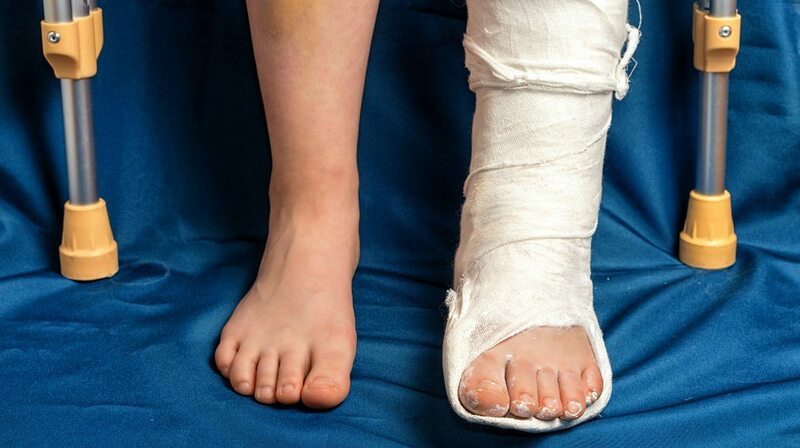 Midfoot fractures make up only three to four fractures for every 100,000 population per year. Usually, it is the cuboid bone that is fractured (about 50 percent of the time), followed by the navicular fractures which make up 44 percent of all midfoot fractures. There are five bones in the midfoot. These include the navicular, the cuboid, the medial cuneiform, the middle cuneiform, and the lateral cuneiform bone. There are multiple long and short ligaments which tie these bones together. The main mechanism of injury is high energy trauma, which is seen in a motor vehicle accident or motorcycle injury. A fall from a great height, low energy injuries, and dance activities can cause a midfoot injury. The patient with the midfoot fracture may have a simple limp or may have severe pain, swelling, and a lack of ambulation on the foot. Stress maneuvers of the foot will worsen the pain. Because of the risk of neurovascular injury, the nerve and blood vessel function should be evaluated at the time of the injury and serially thereafter. X-rays of the front and sides of the foot and oblique views must be undertaken. Weight-bearing views and stress views of the foot should be obtained to pick up occult fractures. A CT scan can be helpful to see non-displaced fractures of the bones of the forefoot while Magnetic resonance imaging (MRI) can pick up ligamentous injuries and other soft tissue injuries of the foot. A medial stress injury can happen if the midfoot is adducted to the hindfoot. This can cause avulsion fractures of the talus or navicular bone or avulsions of the cuboid or calcaneus bone. There can be severe injuries which cause dislocation of the bones of the forefoot. Some of the midfoot joints can become dislocated in a severe injury. A longitudinal stress injury can pass forces up from the metatarsals, fracturing the navicular bone. Lateral stress injuries include the “nutcracker fracture” in which there is a lateral force on the forefoot crushing the cuboid bone. Sprains can occur if the force is directed at the plantar region of the foot; avulsion fractures of the navicular, calcaneus, and talus. If the midfoot is just sprained, a non-rigid dressing can be used with partial weight bearing for 4-6 weeks. The midfoot needs to be immobilized if the sprain is severe. If there is a fracture of the midfoot, then a short leg cast is used with non-weight bearing for up to six weeks. If there is a high energy fracture with displacement and dislocation, open reduction and internal fixation may be necessary. If the joints are involved, the prognosis is guarded. In cases of cuboid injuries, bone grafting may need to be done to rebuild the cuboid bone. Severe crush injuries require fusion of the bones to restore the arch of the foot. Post-traumatic arthritis is likely in these types of injury. Sometimes fusion of the bones is necessary to relieve the pain of arthritis. It is rare to have an isolated fracture of the navicular. This is an important bone because it creates the arch of the foot, and it is where the inversion and eversion of the foot are initiated. The bone connects with all three cuneiform bones; they do not move but rather dissipates the loading stress on the foot. The mechanism of injury to the navicular bone can be a direct hit to the bone. The injury is indirect because of axial loading onto the foot. Stress fractures are possible with athletes who do a lot of running and jumping. When the navicular is injured, there is the pain in the foot with swelling and tenderness in the area of the navicular bone. X-rays can show the fracture in some cases. A CT scan or MRI scan may need to be done to show non-displaced fractures and ligamentous injuries. Non-displaced fractures of the navicular bone can be treated with a short leg cast with a restriction of weight bearing for 6-8 weeks. If the fracture is still unstable after 10-14 days, it may have to be treated with surgical methods. If the fracture is unstable at any point, surgery is necessary. K-wires or screws are used to stabilize the fracture. If an area is crushed, a bone graft is often recommended. If the joint cannot be restored, a surgery to fuse the joint is usually undertaken. After surgery, a cast or brace is used to immobilize the bone with non-weight-bearing for up to 12 weeks. Non-union or post-traumatic arthritis can occur as a complication of the fracture. The cuboid bone can be fractured as an isolated event, however, the fracture is often associated with other injuries to the foot. Most cuboid fractures are “nutcracker fractures,” which occur when there is torsional stress or forefoot abduction injuries. Extreme plantar flexion is seen with ballet dancers or people with Ehlers-Danlos syndrome. Stress fractures can be seen in athletes. Pain and tenderness can be seen on the lateral aspect of the foot. The X-rays of the foot can show the fractured areas, but a CT scan or MRI scan may be necessary to diagnose stress fractures or other non-displaced fractures. Treatment can be non-operative with the placement of the patient in a non-weight bearing cast for 4-6 weeks. If the joint surface is displaced, then open reduction and internal fixation may need to be done. Complications include avascular necrosis also known as osteonecrosis, post-traumatic arthritis, or non-union of the bony fracture. These are rare injuries which can be associated with other injuries of the foot. There is little movement across these joints with only 10-20 degrees of motion seen at the far lateral side of the foot. There are strong ligaments which link the bases of the metatarsals to the midfoot bones. There is no ligament attaching the base of the first and second metatarsals. The main mechanisms of injury include a twisting force on the forefoot, an axial load to the foot or a crush injury, usually seen in industrial settings. The patient usually has pain in the foot associated with a foot deformity. There needs to be a high index of suspicion for injuries to this joint to be identified and many are missed in the first two weeks following the injury. There can be a laceration to the dorsalis pedis artery resulting in vascular compromise of the foot, which can also cause a compartment syndrome to happen. This injury can be diagnosed with plain film x-rays. This type of fracture is commonly seen with metatarsal fractures or fractures of the cuneiform bones or the cuboid bone. The fractures can be minimally displaced or severely displaced, depending on the degree of injury. Treatment can be non-operative and are considered sprains. If there is minimal displacement, a well-molded short leg cast can be used with non-weight bearing until it is comfortable to bear weight on the foot. If there is displacement of the joint surface, open surgery with internal fixation needs to be done. Screws are used to hold the displaced parts of the fracture together. The lateral metatarsals are held together with Kirschner wires. An inter-cuneiform fracture which is not stable needs to be held together with a screw. After the surgery, the foot is immobilized in a boot or non-weight bearing cast for 6-8 weeks. Complications include post-traumatic arthritis, compartment syndrome, reflex sympathetic dystrophy, infection from surgery, hardware failure, and injury to nerves and blood vessels. The forefoot is responsible for load sharing of the foot. The bones are made in such a way they can help you if you are walking on uneven terrain. Fractures can be displaced or non-displaced. Displaced fractures disrupt the major weight-bearing part of the forefoot. Fractures can occur when a heavy object is dropped onto the foot. A twisting injury can fracture the forefoot and they can be involved in stress fractures. The patient usually has pain in the foot with tenderness over the site of the fracture. There can be neurovascular compromise along with an injury to the soft tissue around the fracture site. Weight-bearing X-rays in the frontal and lateral view can usually show the fracture. 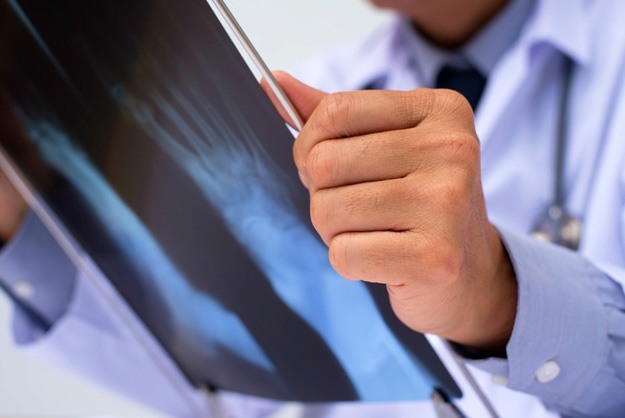 X-rays should include the entire foot because of the risk of other injuries. An MRI scan or a technetium scan can be done to find occult fractures. There are usually two types of fractures: the proximal fracture of the base of the metatarsals and the spiral fracture of the distal part of the bone. Treatment usually involves a short leg cast with weight bearing or non-weight bearing depending on the orthopedic surgeon. Because the union is not given, some patients need open reduction and internal fixation of the fracture. A normal gait is not possible if these joints are disrupted. Fractures to the first metatarsal phalangeal joint usually happen in athletes or in ballet injuries. Injuries have increased in athletes because of the higher incidence of artificial turf. The joint can be sprained when the athlete jams the great toe into astro-turf, while ballet injuries happen when the ballet dancer falls over the extended joint, injuring the joint capsule. High energy trauma can cause dislocation of the joint. The patient usually presents with pain and tenderness over the great toe joint. X-ray of the top of the foot and the side of the foot will show injury to the joint. Treatment of a first MTP joint involves rest, ice, elevation, and non-steroidal anti-inflammatory medications. A firm supportive shoe can also be used with a rocker bottom to prevent pressure on the great toe. Dislocations can be attempted in a closed fashion but, if not possible, surgery is necessary. Complications include degenerative arthritis of the great toe or recurrent dislocation of the toe. If the other toes are fractured, buddy taping can be done with the external realignment of dislocations. A firm supportive shoe is recommended. Surgery might be necessary if the joint surface is involved. The sesamoid bones might be fractured from direct trauma or through ballet injuries. The sesamoid bones can be fractured and are usually picked up by plain film x-rays. Occult fractures need MRI scanning or technetium bone scanning. These can be treated with a short leg walking cast or boot for about 3-4 weeks. Complications include excision of a sesamoid bone, which causes overload on the other sesamoid bones. This valuable information about fractured foot may help you deal with a certain foot injury. May this overview also helps you get well in time so you can go back to driving and other fun activities. There are several types and treatments for a fractured foot in which you can refer depending on the situation. Keep in mind the symptoms and the treatment so a more serious condition can be avoided.